Woah! I hadn’t realised my little break from blogland had been so long!! I really did chill out with the family and left a LOT of technology time in the sidelines. SAB and the Summer mini finished yesterday – and so today, we start with our Autumn-Winter mini. This lovely little catalogue will last for four whole months. But if you are anything like myself – and fellow demonstrators – you will ADORE the new products and tools showcased in this mini. Today ESAD has a fabulous blog hop going on – whether you follow from the beginning and arrived from Tina Hewitt, or you’ve joined the hop here, keep clicking on the links at the end of each post, and you will have 25 glorious stops. I recommend a cuppa – and a notebook! – because I think you will fall in love with the talent and the examples on show today. But who – or what – is ESAD? Now… on with the show! I have two projects for you today – both involving the fabulous new cutting tools: Framelits and Edglits. First is this super cute box: I’ve run the completely gorgeous Twitterpated DSP through the big shot with the Box number 2 die – and then used the smallest label framelit to create the window on the front. I wanted a narrow frame around the window to highlight it so I used the same size framelit with Lucky Limeade cardstock, then fussy cut the outer edge using the very faint impression left behind when you lift the framelit from the cardstock. A fancy looking – but oh-so-simple! – ribbon embellishment has added some lush-ness to the otherwise basic project, thanks to the Blushing Bride Pleated ribbon. The cute image hanging in the window is from one of the Apothecary Art stamp set – I’ve punched this image using our 1″ circle. Apothecary Art has been designed specifically to co-ordinate with our framelits. Gorgeous! Finally, the hanging image has been tied with Indigo Island Bakers Twine – a further addition to the already wonderful Bakers Twine range introduced in the Summer mini. I love it! Wow!! Five brand new products in one project…!! AWESOME! And here is Project #2: A card using the Adorning Accents Edgelits – and the co-ordinating Adorning Accents Textured Impressions Embossing Folders. I’ve watercoloured (with Blender Pens) the very pretty flowers from the Bordering on Romance stamp set. This set has been designed to co-ordinate with the Edgelits – perfection! Having stamped and coloured the image, I’ve then chosen a larger size Framelit to cut perfectly a shape. The bottom of the shape has been de-bossed with the seriously cute small hearts from the Adorning Accents embossing folder… and there is more of that Backers Twine and Pleated Ribbon. The Pleated Ribbon comes in four fabulous colours – I dare you not to get them all!! The spritzing effect on both the card base and the image was achieved with some old-school spritzing using a marker and spritzing tool – with a touch of sparkle on the image thanks to some gold smooch… yum! I hope you have enjoyed your stop here, now it’s time to hop on over to Yvonne. 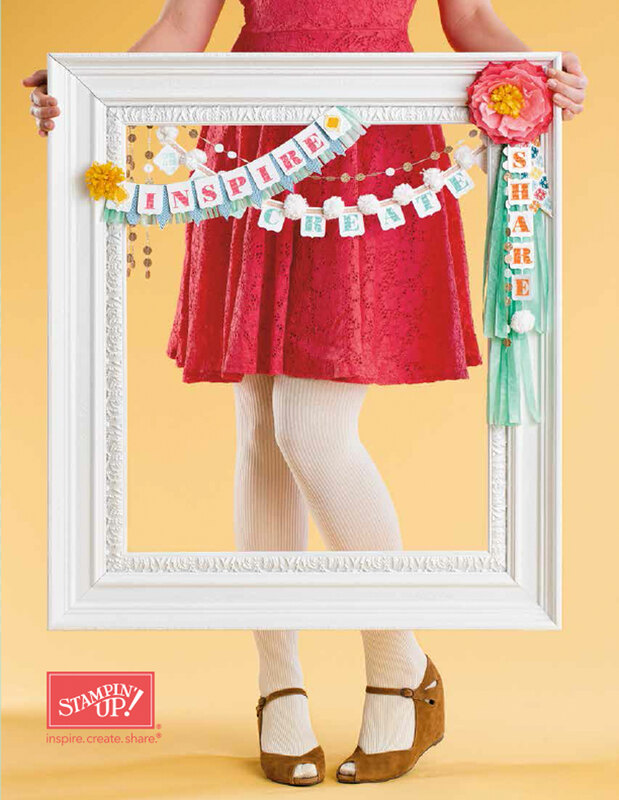 She has some really fun ideas using Mixed Bunch and the Blossom Punch. I have started to post out copies of the Mini to my regular customers – if you would like to receive your own copy, email me with your details and I’ll get one off to you as well. from → 3D projects, Cards, ESAD Blog Hop, Gifts, Mini Catalogue, Stampin' Up! Love what you have done Kelly. Some great projects using lots of the gorgeous products from the Mini. Love the box – so pretty & love the idea of punching out part of the label. OK I think that I am totally sold now and will have to buy Bordering on Romance thank you for finally persuding me. So very pretty Kelly. Great projects. So pretty! Thanks for sharing. Wow!! Great projects – they are just both gorgeous! great cards. I love this set. Gorgeous projects Kelly..love love love that bottom card! 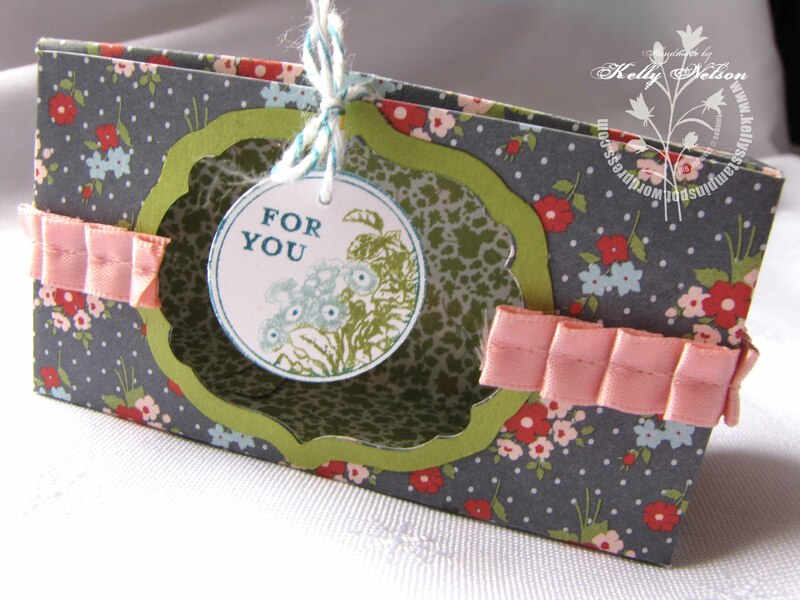 Great use of the framelits on the cute box Kelly & love the card – fab layout & & just love that edge. Beautiful! oh my … so so sooooooooo pretty!! love it Kelly!! Love the use of the embossing folders, you’ve inspired me to pull mine out and use them. Many thanks for presenting this. Quickquery, if you wouldn’t object. Where did you grab your weblog design? I’m creating a blogging site and like yours. Hi Gordon, I’m using the Vigilence theme from WordPress – totally free! and it is a customisable one that I have added the widgets, banner, chosen my colours etc. Cute Idea for the box die and I love the pleated ribbon too.